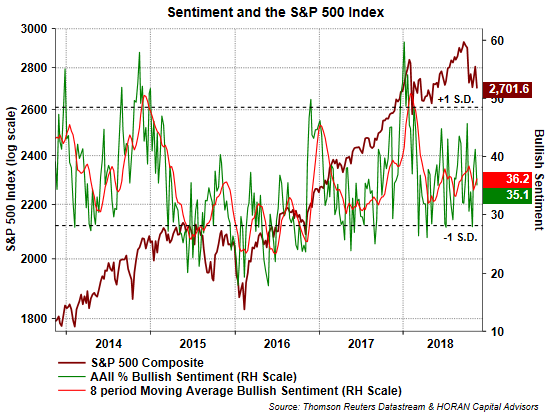 At the end of October the American Association of Individual Investors reported individual investor bullish sentiment was 28.0%, one standard deviation below the bullishness average. Sentiment measures are contrarian ones and are most actionable at their extremes. October's reading was certainly not an extreme level; however, the reading was at a low level of bullishness for the individual investor sentiment measure. Since the January market high, the bullishness reading has vacillated between +26% to +45%, with a level in the mid teens being an extreme. Today's reading of 35.1% bullishness falls within this range, as does the 36.2% 8-period moving average. 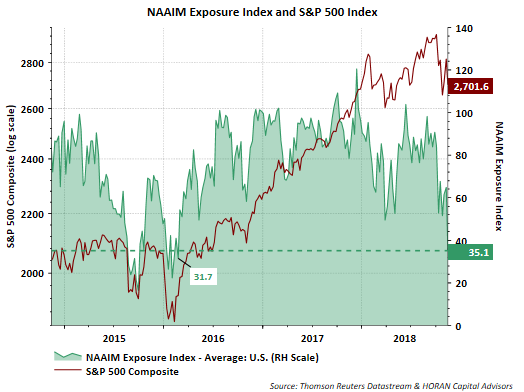 Interestingly, the NAAIM Exposure Index was reported at 35.1% this week. This is a level last reached in early 2016, i.e., near the market's 2016 low. The median response was 45% and was the lowest median reading of the year. For readers, 0% means active managers are 100% cash or hedged to market neutral and 100% means managers are fully invested. "In one respect, they [fund managers] are still bullish: global equity allocations are still 31% overweight. Into the major lows in 2011, 2012 and 2016, fund managers were underweight. Allocations could easily fall much further before global equities reach a bottom. But in most other respects, fund managers are already very bearish:..."
From a contrarian perspective, bearishness seems increasingly a more pervasive thought. Sentiment is not at an extreme bearishness level yet. Other measure like the put/call ratio are elevated but not at an extreme, however, sentiment continues to move in a more bearish direction.